For much of its life, the location of the Prince Hall Masonic Home was simply noted as “foot of 37th Avenue,” an appropriate address for this historic building. Surprisingly, it still looks much as it does on our “real photo” postcard as it overlooks a scenic view of the Rock River. Many think that its name means this building was called a hall. Rather it was named in honor of a man, Prince Hall, who is known as the Father of Black Masonry. Black Masonry is as old as this country. It began at the time of the Revolutionary War in 1775, when fourteen free black men were initiated into Lodge 441 in Boston. But Black Masons did not receive all Masonic privileges until 1784, when the Grand Lodge in England granted a charter to African Lodge 459. Soon thereafter, the African Grand Lodge was created and Prince Hall became its first Grand Master, serving until his death in 1807. Masons were and are male organizations. Recognizing that their wives, widows, sisters, and daughters also wanted to be a part of Masonry, the Order of Eastern Star was created as a feminine counterpart to the Masons. The Prince Hall Grand Lodge continues in existence today with over 4,500 lodges worldwide and a membership of over 300,000. According to their website, “any good hearted man who is worthy and well qualified can seek more light in Masonry”. And the good-heartedness of Illinois Prince Hall Masons and Eastern Star ladies was demonstrated as early as 1891, when they created their first statewide home for aged Masons, widows and orphans. That home, located at the rear of a member’s home on South Dearborn Street in Chicago, was replaced in 1896 with another home at 33rd Street and Armour Avenue. In 1927, after adjacent land was purchased, the frame home was replaced with the grand building on our postcard. As many as five thousand people, including dignitaries from across the state, attended the dedication of this $75,000 three-story brick building that was 29 by 151 feet and could house 73 people. Our postcard was probably made shortly after the dedication, before the previous home was demolished as planned. It shows the facade from the northwest, with its classical two-story porch that faces the Rock River. The building is parallel to the river and the two-story porch offers one of the most beautiful and undeveloped views of that waterway and Turkey Island. The porch is actually at the back of the building, and it was obviously designed to provide great pleasure to its residents. The opposite side contains the single story main entrance that is framed with Masonry and Eastern Star emblems. A magnified view of the postcard shows ladies and gentlemen on the porch and on the grounds, all well dressed, with most wearing hats. The other, main entrance, side of Prince Hall is shown in another photo of the same era. 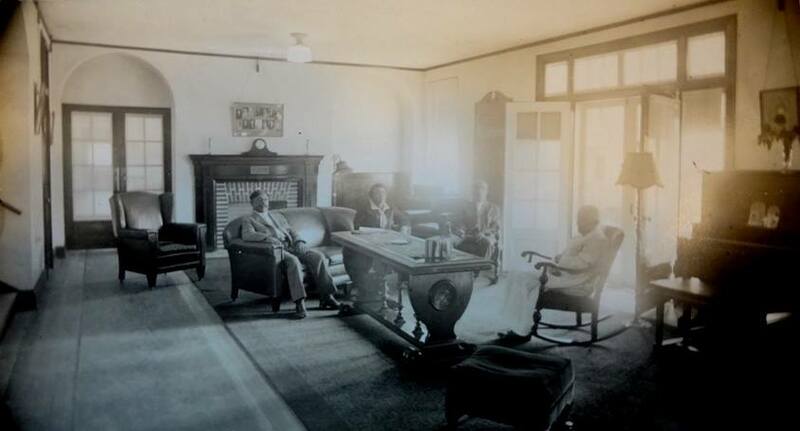 Another rare picture shows the interior of Prince Hall. Black Masonry is now represented in Rock Island by the King Solomon Lodge No. 20 at 5th Avenue and 11th Street. 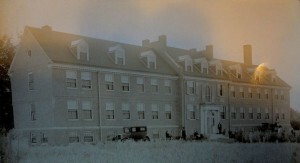 Around 1970, several additional buildings, appropriately named Riverview Apartments, were constructed in front of the original Prince Hall Home. More recently, the 162 apartments were taken over by a private owner and renamed Maple Ridge Apartments. But you can see the original Prince Hall Home tucked behind these new buildings, still with a marvelous and unobstructed view of the river from its ten apartments. It’s worth a visit to see this building that is so significant in Rock Island’s black heritage. 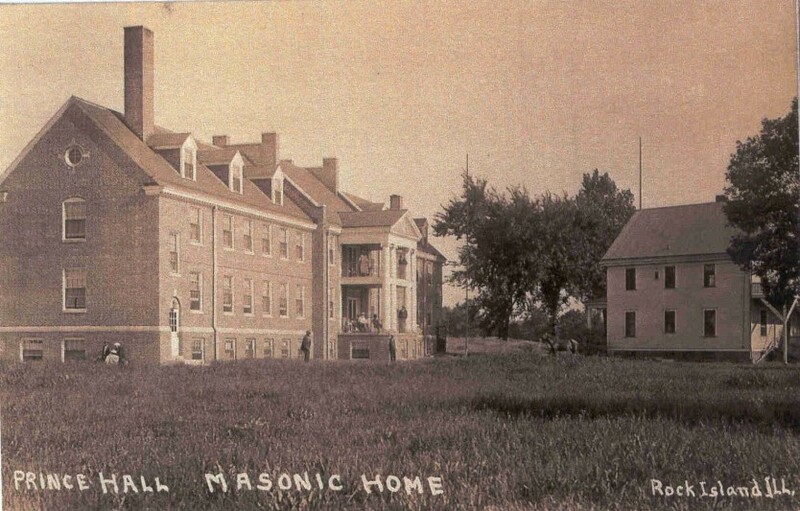 Even today, it is obvious that the original Prince Hall Masonic Home is indeed “a pretty place in the heart of nature”. This article by Diane Oestreich is slightly modified from the original, which appeared in the Rock Island Argus and Moline Dispatch on February 24, 2002. UPDATE, 2018. The King Solomon Lodge Masons now meet at the King Center and have abandoned their 11th Street-5th Avenue building. In May 2018, it was announced that demolition of that building is now imminent.